As a multi-disciplinary team, our diverse and high-profile client list reflects the strength of talent behind the young creative team of urban and housing designers, interior and workspace designers , product, brand , graphic , service and event designers. Over 35 years' experience has seen us collaborate with the likes of Sainsbury's, John Lewis, The National Trust, B&Q, Argent, eBay, Southbank Centre and Royal Mail, to name a few. When it comes to housing regeneration, we've influenced the skylines of Gateshead, Dartford, Manchester, Maidenhead, Bournemouth, Blackburn, King's Lynn, Skelmersdale and Whitehaven, each with great acclaim. Recently we headed the £18m re-imagining of Dreamland in Margate, where we carefully unfold the 1920s-50s design and pieced it back together in a way that preserved its historical integrity, but also made it an exciting and culturally significant for a modern audience. Then there are our cultural events, placemaking and exhibitions. Since 2010, we've produced over 40, including the annual Vintage Festival, Classic Car Boot Sale and The Festival of Thrift, the National Festival of Making, Urban Village Fete and SAMPLE which enjoyed a combined audience of over 250,000 in 2016. They are also a perfect reflection of HemingwayDesign’s personality; a mind focused on community values, one eye searching for great British design and both hands transforming a sow’s ear into a silk purse. Our place-making and meanwhile use experience has led to us establishing a place brand arm and we are currently producing place brands for Bognor Regis, Middlesbrough and Thamesmead. Our marketing arm, HemingwayDigital, is where our web consultants, advertising executives and creative designers fuse together. We craft success stories for brands we believe in, connecting them to the niche audiences we've been influencing for decades. Working across print, advertising and digital channels, and with expertise in online strategy and social media, our campaigns filter through the blurred messages of today's media, and target consumers head-on. And finally, the last string to our bow, our brand, graphics team. They provide the design and branding expertise to transform corporate identities into communicative tools, which strike at the heart of the customer base. Discover how we did exactly that for Unite Students , where rigid, inward-facing branding was opened out into an immersive and playful voice, and one which suited both client and customer – and the digital age. We have just completed a new visual identity for one of the UK’s largest regeneration and housing companies, St Modwen. 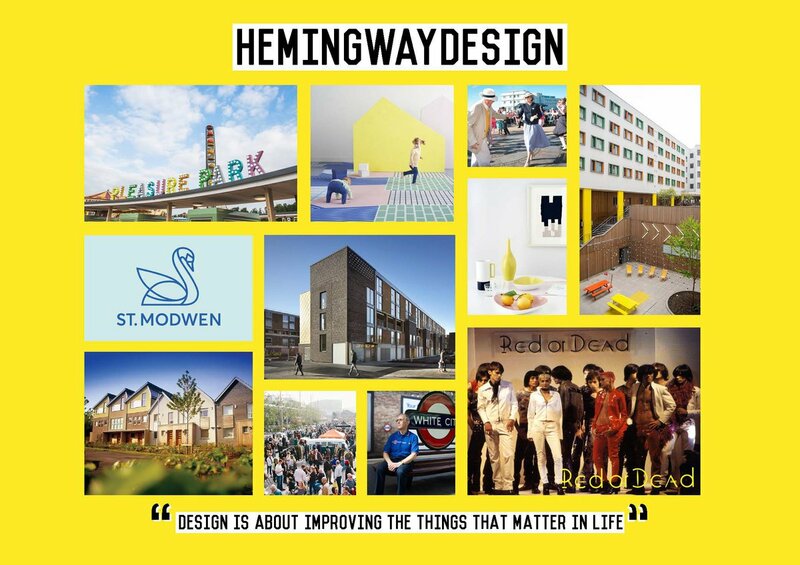 HemingwayDesign have been visionaries for over 35 years, and throughout it all, our feet were – and will continue to be – firmly planted in societal needs. Our first vision was to create the affordable designer label, Red or Dead. We did that rather well, truth be told. Our most recent projects have focused on supporting and developing the UK’s knowledge-based industries, such as The Bridge Dartford and a 1,000 unit extension to the University of Warwick’s accommodation. We love to be beside the seaside, and as well as our work in Boscombe, Margate and Morecambe, we have created a vision for Lowestoft South Beach - and are working on a concept to take Weston-super-Mare’s Tropicana into a dynamic arts led future, are embarking on a vision for part of Exmouth’s beach front and helping out on a nice project in Bangor, Northern Ireland. As for our next project, well – you tell us. We’d love to help bring your vision into reality. Events - allowing the creative industries to grow and thrive - and to have fun! Graphics and Branding – At the Design Week Awards in 2016, we won the Identity Design award for our brand and identity for Dreamland Margate. This project was also nominated for a Beazley Designs of the Year, with an installation in the newly opened Design Museum in Kensington. Our re-brand for Unite Students was awarded a gold London Design Award in 2014.